On Aug. 25, 1997, students attended the first day of classes ever held at the brand-new Florida Gulf Coast University. 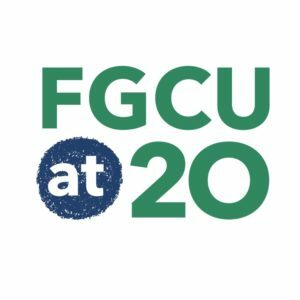 So it’s fitting that students, faculty and staff will gather two decades later on the same date for FGCU’s 20th Anniversary Celebration. The campus community will mark the milestone from 9 a.m. to noon Aug. 25 in the Cohen Center ballroom with lots of interactive games, prizes, giveaways and special food. (Due to the weather forecast, the event was moved from the outdoor location originally announced.) Guest speakers will include our new president, Mike Martin, who will address the gathering at 10 a.m. (to be shown on Facebook Live). A trivia contest will be part of the fun, so start studying up on university history at our special FGCU at 20 website. We’ll end with a little factoid that shows just how much we’ve grown in this relatively short time. The inaugural enrollment in fall 1997 was 2,584; this fall’s preliminary count is 14,723.